As leaders who care about company culture and happier employees, you already know that TINYpulse is invaluable in gathering feedback to promote positive change within your workplace. A lot of the hard work that goes into responding to feedback and inciting change happens in the background and isn't necessarily immediately visible to your teams. To celebrate the positive change that's happening in your workplace as a direct result of TINYpulse feedback, take advantage of the Wall of Wins. 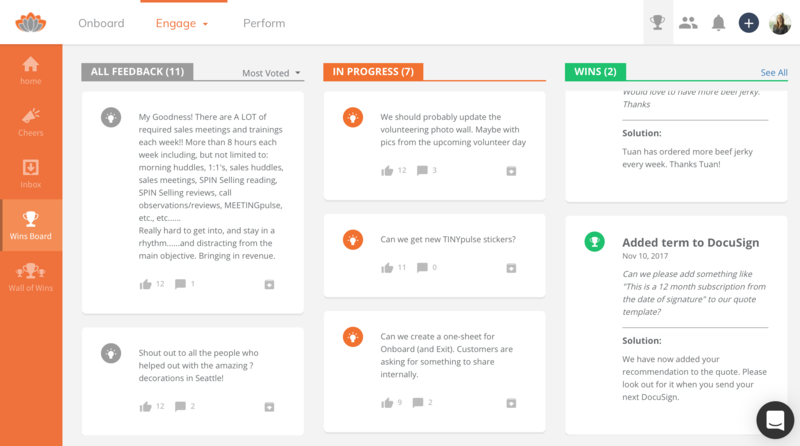 The Wall of Wins lets you document and showcase all the positive changes that you've made based on employee feedback. Once you add Wins, you can use the URL to share the WoW page with employees, advisors, candidates, and customers. In addition, the WoW page will also have a tab for you to add your organization's mission, vision, and values. To activate your WoW, go to Share -> Wall of Wins from Engage. Once you click to that section, a separate tab will open in your browsers with the wall itself. Share the Wall of Wins by simply copy and pasting that URL and sending it out to your employees, leaders, advisors, etc. Alternatively, you can publish the Wall of Wins to LIVEpulse for employees to view whenever they need a pick-me-up. Read more about publishing the Wall of Wins to the employee portal. Once you've sent out one TINYpulse survey, gotten some feedback, and taken action, you can add a Win. Wins are special and should be reserved for feedback that you've taken positive action to improve. You can add a win for both survey responses and suggestions, but suggestions are the most common wins since the employee is directly suggesting that some action should take place. Add an item to the Wall of Wins by finding the piece of feedback you've addressed and resolved and selecting Win from the status dropdown menu. Just add a title and your explanation of why it's a Win and click Save to post it to the Wall of Wins. When you post a new Win, employees receive an email to draw their attention to the achievement. Another way to keep employees updated throughout the process is by using the Wins Board. Track progress of initiatives (suggestions, responses, or add your own idea) and celebrate Wins directly in the employee portal where everyone can participate. Learn more. Can your employees recite the company's mission, vision, and values with their eyes closed and fingers crossed? The Culture tab on the Wall of Wins is a great way to reinforce these all too important cultural drivers. Go to Users and Settings from anywhere in TINYpulse and click Settings. The Wall of Wins settings are at the top where you can enter your company's mission, vision, and values. These messages will be available on the Culture tab on the Wall of Wins the next time it's refreshed. You can also copy the public WoW link from here and share it out as you like.